The Maryland colony was founded by Cecil Calvert, 2nd Baron Baltimore, and hence is based on his family's coat of arms. During the American Civil War (1861 to 1865), Maryland officially stayed in the Union, but many Maryland residents fought on the Confederate side in the Army of North Virginia. The Maryland State regiments fought under a black and gold banner, and the Confederate Marylanders serving under the red and white cross ("Crossland") design. Following the Civil War, there was a need for reconciliation in the state, and the flag showing both designs became increasing popular. The current design was officially adopted as the state in 1904. Show your Maryland pride with this state flag design featuring the Calvert and Crossland family crests. Annin Flagmakers Model 142370 Maryland State Flag 4x6 ft. Nylon SolarGuard Nyl-Glo 100% Made in USA to Official State Design Specifications. Quality! Expertly printed and sewn using Annin's 200 DENIER NYLON fabric in our Virginia factory with our exclusive SolarGuard dyes. PROVEN to last the longest and be the BRIGHTEST. DURABLE fabric flies in the lightest breeze. Blocks damaging UV rays. Annin Presentation Box! Each flag ships in an OFFICIAL ANNIN FLAGMAKERS presentation box. Makes an excellent gift for family and friends to PROUDLY display at your home or business. The Maryland State Flag is complex design borrowed from the first Lord Baltimore's, George Calvert, family coat of arms. 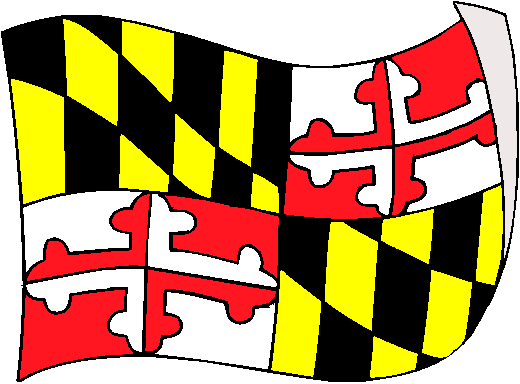 The upper left and lower right corners of the Flag contain the Calvert family coat of arms, a black and gold design with six vertical bands in the Maryland state colors. The upper right and lower left cantons reveal a red and white design from the Crossland coat of arms in honor of George Calvert's mother who was a Crossland. All Annin Flagmakers flags are sewn in either South Boston, VA or Coshocton, OH. Annin's superior quality is time-tested and meets the requirements of the most discerning buyer.